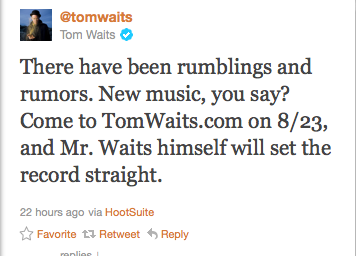 According to a somewhat mysterious tweet, we may be on the verge of another Tom Wait’s record. Of course, if you read down the tweet stream, you can see postings about new songs and the like. Either way, head over to his website on Tuesday August 23rd to hear from the man himself about what’s new. Tweet below….